Even without the three-day residency of Ahmad Jamal at the Dakota, this week would be jam-packed with special jazz events. But, we do get three nights of the Ahmad Jamal Trio to boot. 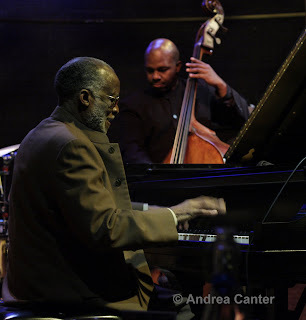 There are few pianists who have been held in such high esteem as Ahmad Jamal. Miles Davis wanted his pianists to play like Jamal. Most pianists who came of age from the 60s on count Jamal as one of their significant influences. Jamal, soon to celebrate 80, is ageless, timeless in his approach to the music, a leading practitioner of the orchestral approach to small ensemble jazz, one who caresses space, gives each note special treatment. His music of late seems even more adventurous--clearly he is at no loss for ideas even six decades into his career. He's enjoyed a long association with bassist James Cammack, who might otherwise be as well known as Dave Holland or Charlie Haden. New this time around is drummer Herlin Riley, although Riley worked with Jamal some years ago and has been to the Twin Cities in the company of Wynton Marsalis and Jazz at Lincoln Center on a number of occasions. This is a legend who is constantly evolving, and no matter place to hear him than in the intimacy and pristine sound enviroment of the Dakota, Sunday through Tuesday (2/21-23). Even before we get to Jamal, there's a lot of win-win choices to make. At the Artists Quarter this weekend (2/19-20), young composer/drummer Matt Slocum returns to home territory with his trio of equally compelling young sidekicks, tenor saxophonist Walter Smith III and bassist Joe Sanders. Slocum, born in St. Paul and raised nearby in New Richmond, WI, studied with Phil Hey before heading west to the Thornton School of Music at USC and the tuteledge of Peter Erskine, John Clayton and Shelly Berg. He returned to the Twin Cities with Sara Gazarek a few times and now celebrates his first CD as leader, Portraits. Matt here proves to be at least as talented as composer as timekeeper, creating some lovely, melodic works that defy identification as "drummer's tunes." Walter Smith III is one of the more exciting young tenorists on the scene today, last in town with Sean Jones. Sanders was runner up to Ben Williams in the recent Thelonious Monk International Bass Competition but no runner-up in his work with firebrand pianist Gerald Clayton and others. An exciting trio, sans piano, will let the compositions' framework shine. Saturday afternoon (2/20) is the fifth annual Bands for Band fundraiser event for three south Minneapolis public school band programs. Held at the Eagles Club (3-9 pm), this is a parent-driven effort to rebuild and sustain school bands at Seward, Sanford and Sullivan public schools. So far it has been very successful, raising enough to keep part-time band instructors on payroll and enabling the schools to offer not only band in the regular curriculum but after-school jazz bands for middle school students. It's a fun day as well, with six area bands from across genres performing as well as the three jazz ensembles from the schools. You get a bit of everything from surf rock to R&B to jazz, including a chance to see vibes master Dave Hagedorn with old buddies as Shrewd Mammals. Plus raising funds for a great cause. There's food concessions, dancing, a raffle and all around family fun. So save a few bands, enjoy diverse music. Most of today's top musicians got their start in a school band. If you don't go to the AQ Saturday evening, check out the Ginger Commodore Quartet at the Dakota (2/20). Together for a long time, this is a tight band supporting one of the finest vocalists you can hear today. Stick around for the Late Night gig with Frankhouse, a relatively new and high energy band led by trumpeter Dan Frankowski. Another special event comes Sunday afternoon (2/21) when we celebrate the life and contributions of the late "Jazzy Jane" Donahue at the Bloomington Knights of Columbus Hall (1-4 pm). Jane passed away in December after a freakish car accident, leaving behind a lot of volunteer hours for the Twin Cities Jazz Society and empty chairs at her favorite venues. Three of her favorite bands, the Mouldy Figs, Laura Caviani Trio and Twin Cities Seven will perform and you can contribute to the new TCJS Jane Donahue Jazz Education Fund. 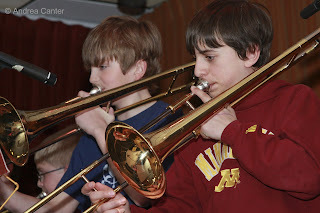 You can continue your support of jazz education by heading over to Famous Dave's in Calhoun Square to hear the Minnesota Youth Jazz Band (3:30-5:30 pm, 2/21). These are Dave Mitchell's students who audition and perform throughout the school year. Or another student-focused alternative is the Martin Luther King celebration featuring Charmin Michelle and the Minneapolis South High Big Band at Ted Mann (4 pm). And the AQ seldom opens on Sundays but you can be sure it is something special when they do. 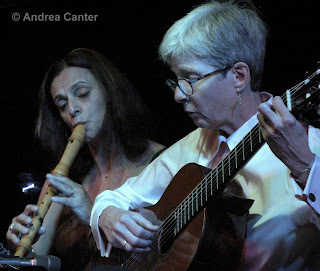 This weekend (2/21), Joan Griffith and Lucia Newell get together with pals Clea Galhano (recorder), Laura Caviani (piano), Gordy Johnson (bass) and Gary Gauger (drums) for a night of Brazilian music--some original compositions, some covers of famed Brazilians like Jobim. One of the highlights of the coming week is the return of Snowblind, an inventive brass ensemble featuring virtuoso performers and composers (Shilad Sen, Adam Rossmiller, Scott Agster, Graydon Peterson and Reid Kennedy). They're on the late night circuit at the Clown Lounge Tuesday night (2/23). Also on Tuesday night, the Dave Schmalenberger Project blasts off at McNally Smith with such veterans as Pete Whitman, Laura Caviani, Chris Olson, Gary Raynor and of course drummer Dave Schmalenberger. These McNally Smith programs are free, start with a reception and end in great music. And speaking of brass, young trumpeter Adam Meckler brings his stellar quintet to Honey on Wednesday (2/24), with Brandon Wozniak, Adam Linz, Zacc Harris and Greg Schutte. At the AQ, two of the "old timers" prove jazz has no age limits, as Marv Dahlgren (2/24) and Gary Berg (2/25) bring their respective, and respectable, quartets to the stage.